Lee Suk Tae, young but already affirmed talent of the Korean fashion scene, graduates in 1994 from the Konkuk University of Seoul and then, in Paris, in 1996, he graduates in fashion design, from the Chambre Syndicale de la Couture Parisienne. In the French capital he enters to be a part of the couturier styling team of the caliber of Christian Dior and Sonia Rykiel. 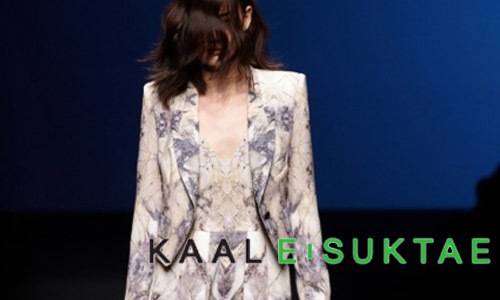 Things are moving quickly for Lee Suk Tae and only a year later, in 1997, he launches his first brand, called Kaal E. Suktae. He is invited to participate in several shows, from the Korean Fashion Association to the Hong Kong Fashion Week, while the following year, the label opens up a store in the Galleria Department Store in Apgujungdong. In 1999 he takes part in an important performance called “Art & Wear” organized by the Korean National Museum of Contemporary Art. 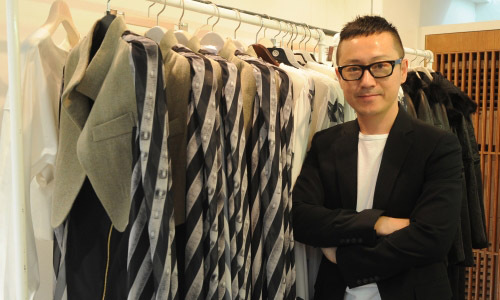 The international vocation of Kaal E. Suktae proceeds nonstop and between 2000 and 2004 he participates both in the Y&K New York Collection and the Lie Sang Bong Paris Collection. In 2004 he is responsible for the creation and making of the uniform of the Amore Pacific Corporation and opens his showroom in Shinsadong. The experience matured over the years has allowed Lee Suk Tae to teach and in 2005 he will be in fact a professor at the Konkuk University. In 2010 he collaborates with WizWid, the colossal online megastore of the Far East, and makes another important step for the brand, that the same year is chosen to participate on The Train NYC! 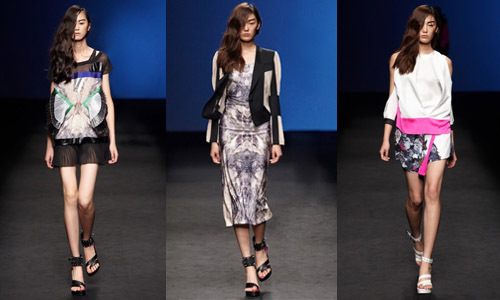 and on the TRANOI Femme Paris tradeshow, concomitant with the Parisian Fashion Week, to which, in 2011, is added other tradeshows, such as Blueprint from Singapore and the Coterie in New York. Yves Saint-Laurent has always been an absolute reference to Lee Suk Tae, and from this admiration you can see traces of also in his last ss 2012 collection, thanks to the use of fucsia, the importance of jackets, impecably structured and sartorial. All his creative universe is surrounded by a purely European influece of which the designer has interiorized it’s characters and moods. 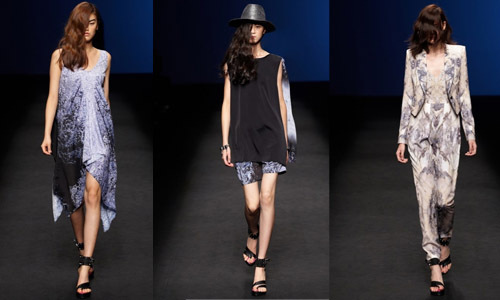 His structural avant-gard, like he loves to define it, forms a leit motiv of the ss12 collection unifying elements of the street fashion and a distinct taste for craftmanship. The collection, called Water from water, is charecterized by a mix of materials declined in colour-blocking and in numerous asymmetries. Geometry, graphisms and overlaying are combined with melanges, besides fabrics and colours: prevalent tones like white, black, light blue in various shades, fucsia, grey and than the floreal fantasies, batik, geometrical. 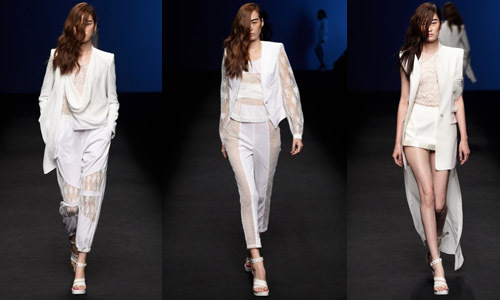 The entire collection highlights a spirit between the romantic and the rock n roll with soft organza dresses and satin alternating with structured shapes of tailleur pants and geometrical jackets with puffed sleeves. The outfits presents styling surprises like sleeves suddenly opening up to the naked skin, swirling rags combined with versatile designed mini skirts, fan-shape effect, given by the very tight folds, applied on jackets and mini dresses. The length of the dresses are beautifuly played between the mini and maxi. The tonalities chosen mark the avant-garde mood of Kaal E.Suktae’s metropolitan princess, self-assured and secure in a look that goes beyond the oriental boundries to be a part of the whole world.